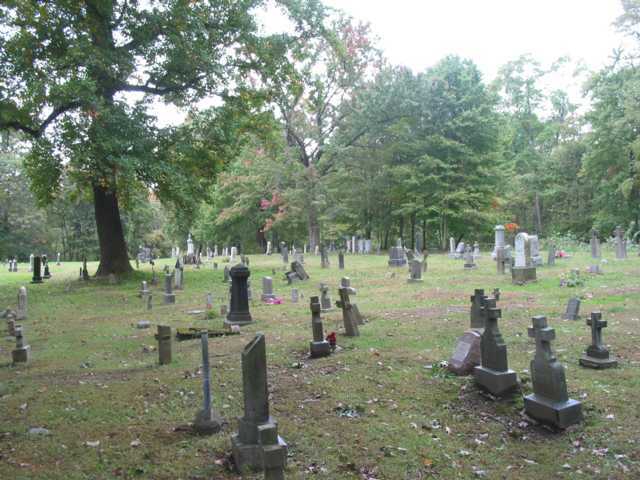 On 2 Oct 2006, I had a chance to visit this cemetery during a visit to my parents in Aliquippa. Dave DeSanzo had already told me about it and he gave me directions on how to get there. 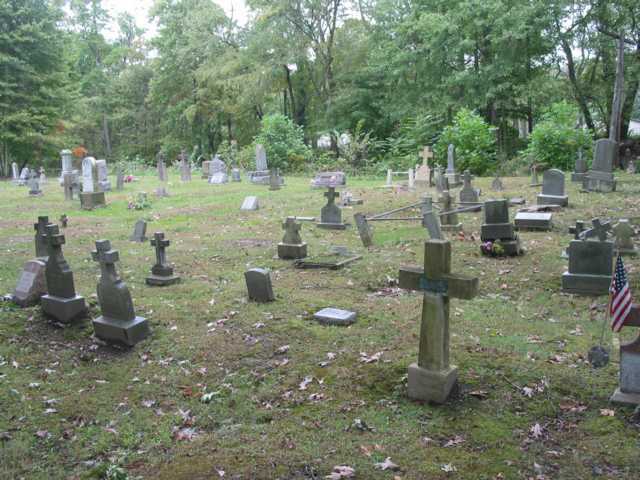 Last weekend I visited the old Saint Teresa Cemetery located in Hoytdale, PA. It is located one mile from my home and is north of Koppel, PA on State Route 18. This is the former site of the original Saint Teresa church which burnt down in the late 1930's or early 1940's. There are approx. 75 graves still located there. However, no one has been buried there since the early 1940's. I took some interesting photos. The first picture is the stone of Armando di Sanza. Armando's father was Bernardo di Sanza. 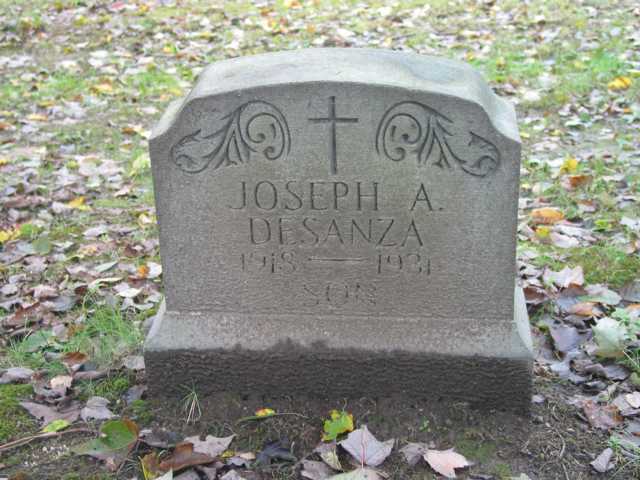 The second picture is the stone of Joseph De Sanzo (spelled De Sanza). Joseph was the oldest son of Luigi di Sanza and Cristine Barile. I believe Della De Sanzo told me sometime ago that Ostilio Rossi actually made these stones himself. I can tell you that they have held up extremely well over time. Perhaps better than most if not all of the stones in this cemetery. Take care. I had Della DeSanzo look at the SPA militia picture over the weekend. Unfortunately, Della was not able to positively identify person #4 listed as diSano Giovanni as her father. However, Della did identify person #21 in the picture as Armando (Herman) diSanza. Armando's father was Bernardo diSanza who was the oldest child of Giuseppe diSanza and Santa LaBate. Armando lived with Giovanni De Sanzo and his family in Koppel, PA. The 1930 census for Koppel, PA states that Armando immigrated to the USA in 1927. Armando worked at the Koppel Industrial Car & Equipment Company as a laborer. Armando was hit in the shoulder while working at the Koppel Car Works and died from complications from his injuries in 1932. 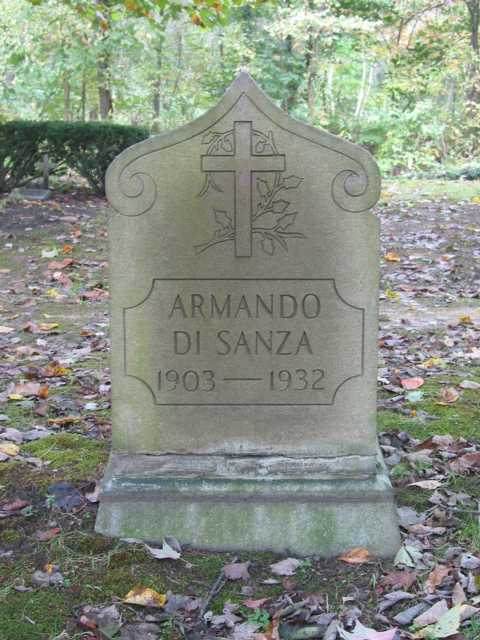 Armando is buried at an old, abandoned, Catholic cemetery in nearby Hoytdale, PA. In the 1930 census, Armando is incorrectly listed as Giovanni's brother. Armando was really Giovanni's nephew. I have also attached a picture of Armando taken in front of the home of Luigi De Sanzo in Koppel, PA. (Mark's note: look on the diSanza web page). Armando is posing with my father Louis who was born in 1922. There is no date on the picture but judging by the size of my father, I would estimate that it was taken around 1927 the same year that Armando arrived in Koppel. Joseph was the oldest son of Luigi di Sanza and Cristine Barile. This is really strange. Perhaps Mark can help sort things out. Last weekend I visited the old Saint Teresa Cemetery located in Hoytdale, PA. It is located one mile from my home and is north of Koppel, PA on State Route 18. This is the former site of the original Saint Teresa church which burnt down in the late 1930's or early 1940's. There are approx. 75 graves still located there. However, no one has been buried there since the early 1940's. I took some interesting photos. The first one is the stone of Amico Gatti. On Amico's stone it lists him as "Father". I searched the Census records for the area and I could not find any "Gatti's" living in the area. So I am assuming that Amico was living with his daughter who's married name I do not know. 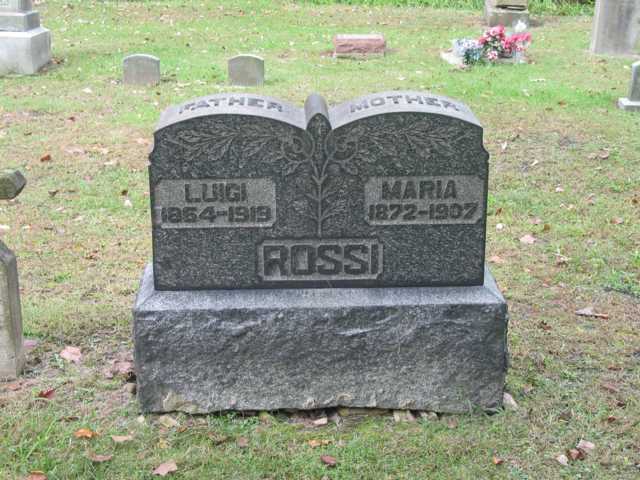 The second photograph is the stone of Luigi and Maria Rossi. I am not sure if he is related to your Rossi family. The third picture is really unusual. It is the stone of a "Giuseppe Buzzeeli". It is all in Italian and appears to be a variant of the surname Buzzelli. The shape is also very unusual. The top of the monument is shaped like a tree trunk with cut branches and all. I hope you enjoy the pictures and perhaps we can identify who these people were. Take care. The family also appears in the 1920 census. 1930 census shows wife's name is Luigina, Amico is dead by then. Three children still living with mother. 25 Nov 1910, 46y, going to New Galilee, PA. Includes wife and 3 children. (all listed as US Citizens). 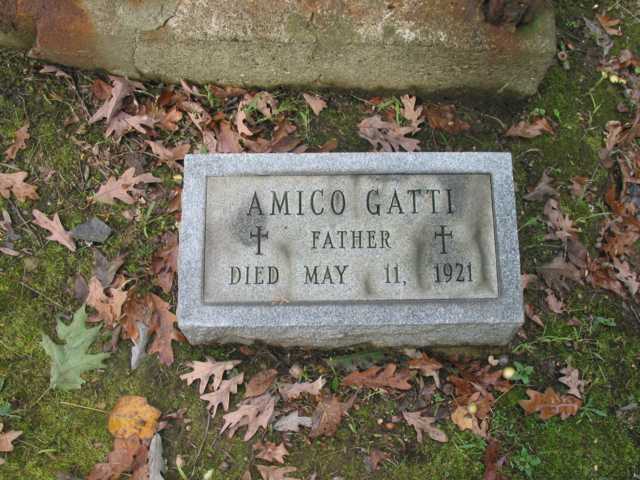 Travelled with Berta diSanza, 18y, going to Homewood, PA.
Dave DeSanzo has since determined that this is the Amico Gatti buried in the cemetery. He is also related to me, a 2nd cousin, 3 times removed. 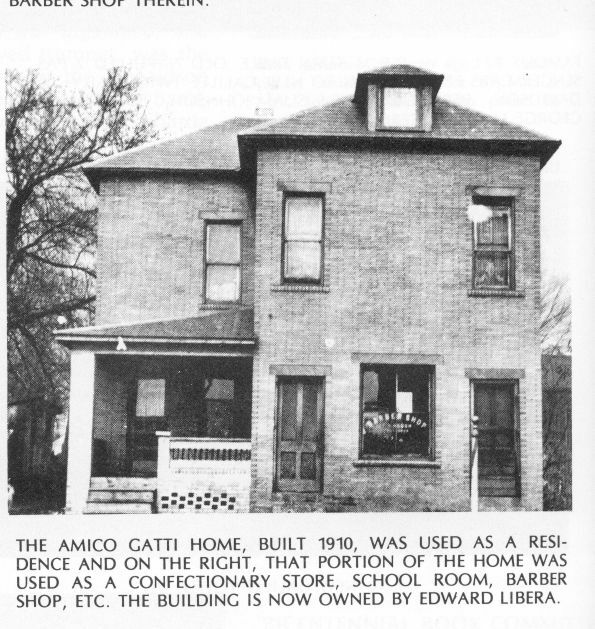 More information on Amico Gatti who is buried in the Hoytdale Cemetery. I found this picture in the New Galilee, PA Bicentennial Book published in 1976. The house is still standing and is located on Monroe Street across from the VFW club. 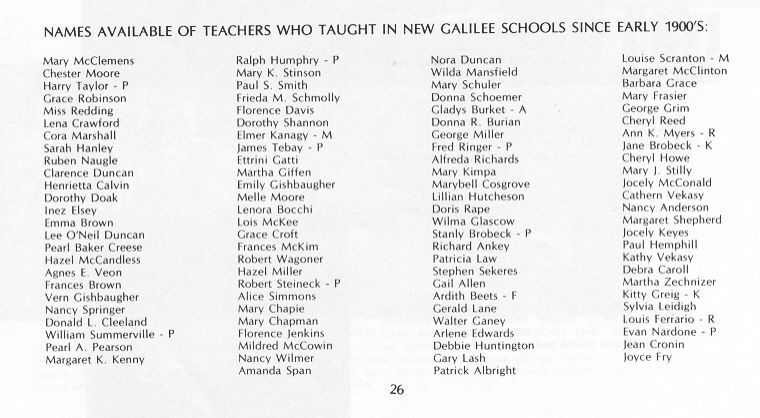 I also discovered on Page 26 of the same book that one of Amico's granddaughters, Ettrina Gatti, is listed as a former school teacher at the New Galilee School. I could not find a Luigi Rossi in the SPA birth records between 1862-1865. Rossi, though, is a good surname from SPA. I've also found four children in 1920 census (Domenic, Alfonso and Rosa living with married Elizabeth Rossi Curtaccio) and 1930 census (Domenic living with married Alfonso). Both of their parents were dead by then. 1910 census, Big Beaver, PA. Mother of Luigi Rossi. The third picture is really unusual. It is the stone of a "Giuseppe Buzzeeli". It is all in Italian and appears to be a variant of the surname Buzzelli. The shape is also very unusual. The top of the monument is shaped like a tree trunk with cut branches and all. 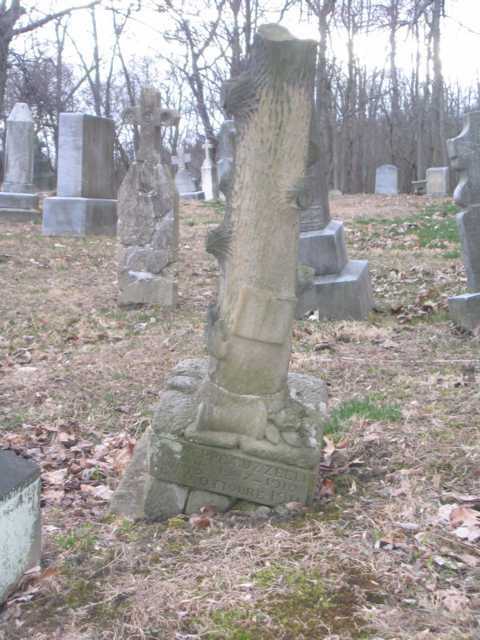 I wonder if this is a Woodmen of the World tombstone? It is stupendous. My Grandmother was Chiara Frazzini, born December 11, 1856 in SPA. Married *Guidenzio* Carlini. Emigrated to USA in the early 1880's. Settled in Homewood Jct. PA. and lived there until death December 29, 1937. Her husband died in 1906 and is buried in Hoytdale cemetery. She is buried in old St. Mary's cemetery. 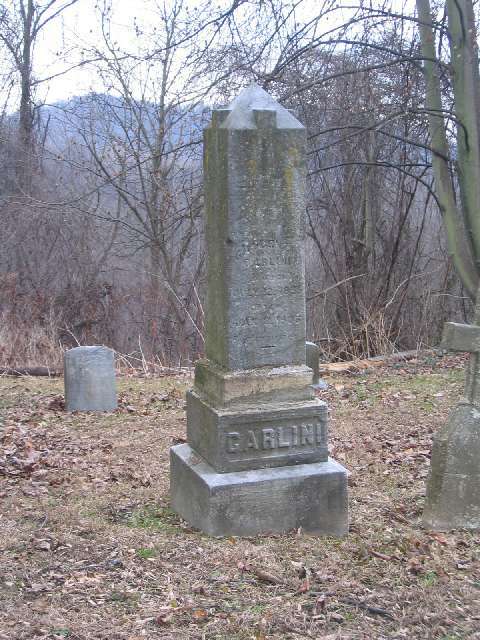 Her brother was Ruggerio (Roger) Frazzini, Freedom,PA. She also had a sister named Bambina living in Freedom. There was a sister in Salt Lake City, married name DiGacamo. Florina (Frazzini) DeSanzo was her sister. Florina married Frank DeDanzo on July 2, 1888 in Pittsburgh. Perhaps there is a distant relationsip between us. Thanks for sharing your extensive hard work. Mark's note: there is a photo of Chiara "Clair" Frazzino on the Buzzelli web page. My Grandfather Guadenzio is buried in Hoytdale Cemetery. I remember going to the cemetery with my Grandmother Chiara Frazzini Carlini. We walked by way of the railroad tracks to the cemetery. After pulling weeds and clearing out the brush, she planted geraniums on the grave. There was no tombstone, only a heavy metal marker with his name. I remember grandmother Chiara saying their infant twin daughter was buried next to him. Gaudenzio Carlini (my Grandfather) must have been one of the 60 passengers from San Peitro on the Ferdinand de Lesseps from Naples to New York in 1882. From New York he must have gone to Homewood. His trade had been that of a stonecutter and at that time the stone quarry in Homewood was in operation. His death in 1906 could be attributed to dust from the stone. 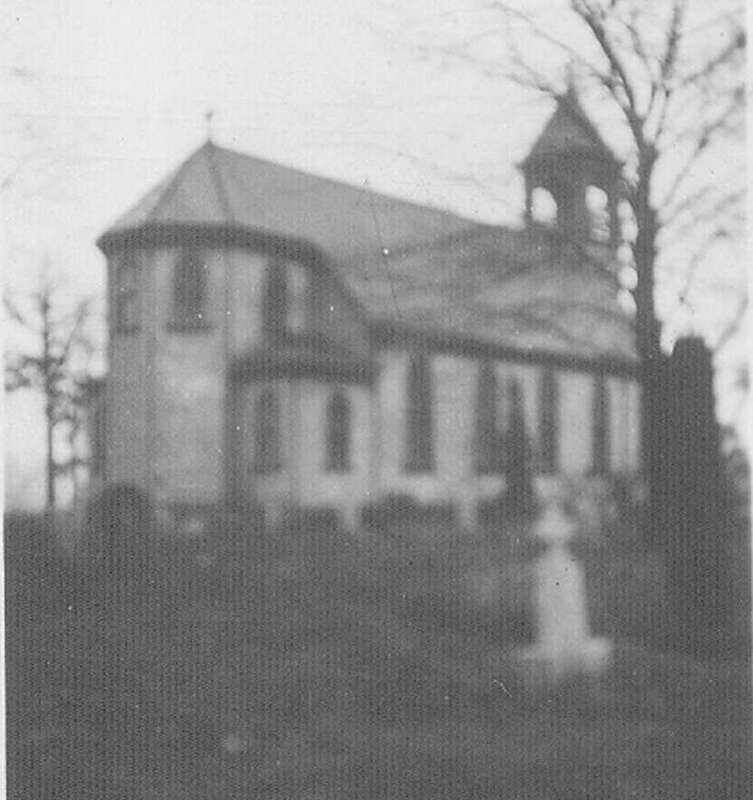 Attached are three pictures of the old St. Teresa church which was located in Hoytdale, PA. The church was destroyed by fire in 1944. The cemetery is all that is left today. 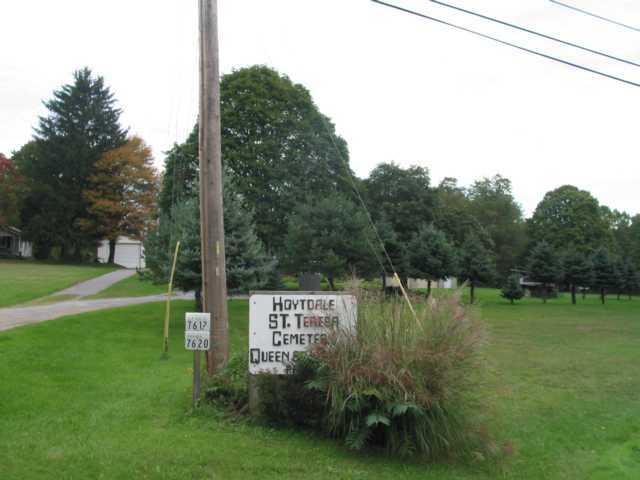 Hoytdale is located one mile north of Koppel, PA on State Route 18. I recently received these photos from the Diocese of Pittsburgh Archives Center. The Archives warned me that these photos were fuzzy. I did not care since these are the only known pictures of the old church. "St. Teresa was founded in 1871 with the building of the church. Before the church was built, a priest came from St. Mary, New Castle, monthly to celebrate Mass in a private home. Work on the church began in May 1871 and the completed church was dedicated on October 15 of that year. The church was built in the town of Hoytdale, then called Clinton. At first, the church was a mission of St. Mary, New Castle. In 1877, responsibility for the mission was transferred from St. Mary to St. Rose of Lima in Darlington. In 1900, fire damaged the church, but it was soon rebuilt. At about this time, St. Teresa was again transferred as a mission to St. Monica parish in Wampum. Fire again struck the church in 1944. This time the church was totally destroyed. Because the majority of the congregation lived in Koppel, the bishop directed that the new church be placed in Koppel. In 1945, the parish purchased an existing office building and converted it into a combination church and school. On May 29, 1962, the parish became independent with the appointment of a resident pastor. By the 1990's, the population of the area dropped to the point that it could no longer support the number of parishes in existence. On August 28, 1992, St. Teresa merged with St. Monica to form the new Queen of Heaven parish. St. Teresa church remains open and serves the new parish." I'll keep my details short. I put my great grand folks on the site findagrave...However the purpose for me is to figure out (Polish translations) from a great aunt. I even contacted Cindi who has pix's on the cemetery St. Teresa's too. My folks had one headstone (now buried very deep). Way back in 1898 for John Ratajski. Later his wife Rose was removed from living out her life in NY state with family. She was sent back to be buried alongside John. I have looked for the folks for 18 years. Finally got my break with notes left in Polish (mentioned above) - west coast great aunt (who died in 1950's)..John was involved in town hall meetings helping the community of Hoytdale... My problem is suggested below.. I am in the starting blocks to reconstruct Hoytdale. I know (approx. )where the post office was...where the town hall was. I know approx. where John and Rose rented a house on Big Beaver blvd. All in 1894-1898. Read and enjoy... My request to you is exactly what is the foot print of the church... Because John, Rose and the "James and families) are located directly at the back end of the original 1870's church and we know James died May-June 1897... As written James died 3 months and 1 year earlier than John and said to look for James and family headstones??? To find John and Rose... The centerline of the original church wold be where mty folks are... James is in the immediate area and I HOPE a name is clearly seen to identify him? Any ideas are appreciated... I can see your families are in and around the area... Are any from the 1900 census time... I missed out since John died and James died before the Hoytdale census info can be used... However I have a pix of them standing at the north side of the Hoytdale Post office on the east side of Big Beaver blvd. between. 1894-1898. Thanks for your interesting email. I don't really know anything about Hoytdale . Now I live in California so I don't have access to the cemetery. I can't help much. The people buried at Hoytdale are distant cousins from my mother's hometown in Italy. She grew up in Beaver Falls and I grew up in Aliquippa. I can offer you a little bit of publicity, though. I'll put your email and any other information you have on my web page. Someone might see it and contact you. I'm going to elevate this (inquiry) of Hoytdale, Pa because many families lived out their lives there. The unincorporated town of Hoytdale, Pa. has board meeting in an old building on Big Beaver Blvd. My great grandfather (we found and translated Polish) was on that board to work through town issues to inprove it. I have worked with and asked Beaver County Recorder of Deeds to provide details of the towns main building including the post office. The New Castle Library...Ellwood Library... The Society at Beaver Falls... and various locals including the Ellwood newspaper for help...None have anything to assist my desire to reconstruct the town of Hoytdale and its progress which my GGF helped. My question is: Is there any documentation of meetings? If Hoytdale is an unincorporated place, the board would have no official status. Mark, I recently read some info on your quest for info on Hoytdale. I live close by and am an avid history researcher. If I can be of any assistance please let me know. I was born in Beaver Falls and grew up in Aliquippa but it wasn't until I started genealogy research decades later that even learned about Hoytdale, Racine, and Homewood Junction. I will be in touch as needed. May I add your email to my St. Teresa Cemetery & Hoytdale web page in case anyon else needs help?